Miller and Levine Biology book on the iPad – A must! I finished up my high school freshman finals yesterday with a 100 on my biology final exam. Yea! My favorite subject this year was..yes, you guessed it…biology! Ecology: Plants are autotrophs, which means they produce food from solar energy. They’re primary producers and very tasty to heterotrophs like us, since we get our food from consuming plants and other living things. Cells: We have eukaryotic cells, which means our DNA is enclosed in a nucleus, unlike prokaryotic cells. Animals: Who knew cladograms could be so interesting? Cnidarians, like jelly fish and sea anemones, are the simplest animals to have radial body symmetry. Human body: Thanks hypothalamus for monitoring concentrations of water in my blood and releasing more antidiuretic hormone (ADH) to let me know I’m thirsty. 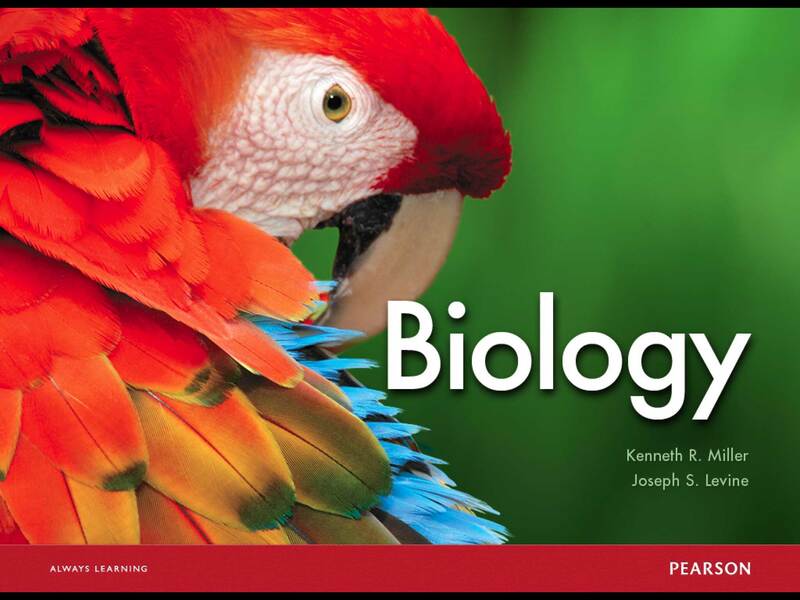 We used the Biology textbook by Kenneth Miller and Joseph Levine. Although the book is wonderfully written with great illustrations, it wasn’t easy for me to learn from with my dyslexia. Fortunately, I was able to to get the iBook version from iTunes and the audiobook version from Learning Ally. I liked being able to select portions of the iBook version and have my iPad read the text out loud to me. Unfortunately, it couldn’t read the text on pictures or diagrams, and that’s why it was helpful to have real people describing the drawings and reading the text in the Learning Ally audiobook that I also listened to using the Learning Ally iPhone app. Try this setup to be surrounded by all things biology: Have your printed biology textbook in front of you, your iBook on the iPad on your right, and your audiobook on your Learning Ally iPhone app to your left. Oh, and your herbarium on the wall in front of your desk! The iBook version of Miller and Levine’s biology book is only $15 on iTunes. Even if you’re not in high school, but you would like to learn about Biology in a fun and easy to understand way, the iBook version is well worth it. As much as I love my iPad and audiobooks, I’m always going to treasure my printed textbook with all my notes, highlights, and well worn pages. Thank you Miller and Levine! I’d also like to thank my wonderful teachers, especially my biology teacher, and my parents for all their help and encouragement this school year. I took a lot of walks with my Dad where we talked about what I learned in class, studied upcoming quizzes and tests, and talked about new advances in science. It was a great school year! I hope you’ll join me for an awesome summer as I get caught up on my blog posts and videos on science, invasive species, and dyslexia. And I also hope you’ll help me kick off the summer at the first Nature Nights at the Lady Bird Johnson Wildflower Center on Thursday, June 12. I’m bringing my Invasive Hunter Academy to help train future invasive hunters and have fun with plants at the same time! 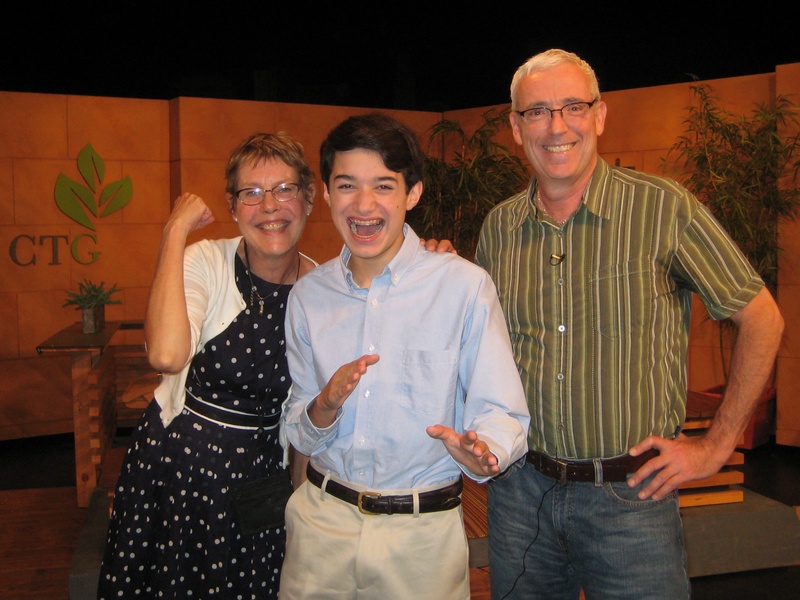 Last month, I had the great honor of being invited to appear on the Central Texas Gardner show that is aired on PBS. When I arrived, I was met by Linda Lehmusvirta, the producer of the show. She took me up to the studio where the show is filmed and introduced me to Tom Spencer, the host of the show. It was so great to meet both of them and they made me feel right at home. When the show was about to begin Ms. Lehmusvirta took my mom to the control room. (My mom said it was really cool!) Once everything was “quiet on the set”, the cameras began to roll and Mr. Spenser asked me all sorts of questions about invasive species, my blog, my videos, and my work with the University of Texas and the Lady Bird Johnson Wildflower Center. The 10 minute interview went by so fast! It felt more like a minute. Central Texas Gardner is also shown on many other PBS stations, including KNCT in Killeen, KLRN in San Antonio, KWBU in Waco, KPBT in Midland, KAMU in College Station, and KBDI in Denver. It’s been very busy with lots of homework, but I’ve been enjoying my first few weeks as a freshman in high school at St. Michael’s Catholic Academy (SMCA). 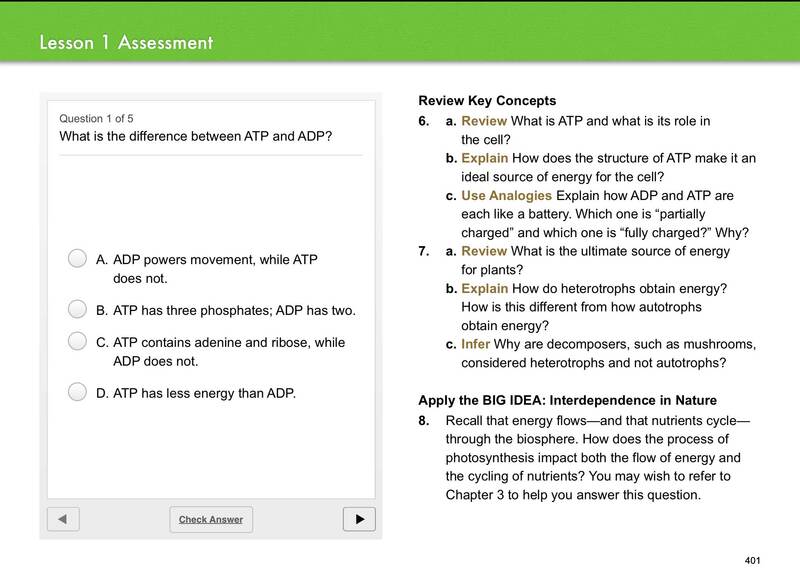 I’ve been using my Learning Ally iPad app for the audio of all my textbooks, including biology and my English books! As I have shared with you in the past, I have very severe dyslexia, but luckily, I also have Learning Ally. For years now, I have used Learning Ally’s audiobooks, which has made it so much easier for me to keep up with my textbooks for school, as well as being able to listen to all sorts of books just for fun. Learning Ally has a great website with lots of audiobooks and resources, so if you haven’t checked it out, be sure to soon. (The have a great iPhone and iPad app that I use to listen to my textbooks.) But now Learning Ally has even more to offer. They’ve started a new site called The 1 in 5 Initiative. Their site is all about dyslexia. But it’s even more than that. It’s an interactive site where you can do all sorts of things like create blog posts as well as videos about yourself and your experiences with dyslexia. My “Commander Ben’s Dyslexia Story” video is also featured on their Being the one stories page. Oh! I almost forgot…you may be wondering…Why do they call the site “1 in 5”? That’s because it is believed that 1 out every 5 people has some form of dyslexia. So be sure to check out the 1 in 5 site soon. I think you’ll really like it. Earlier this week, I had the privilege of speaking to the 8th grade and 7th grade science classes at the Rawson Saunders School here in Austin, Texas. What is so neat about Rawson Saunders is that it is a school for kids who have dyslexia like me. 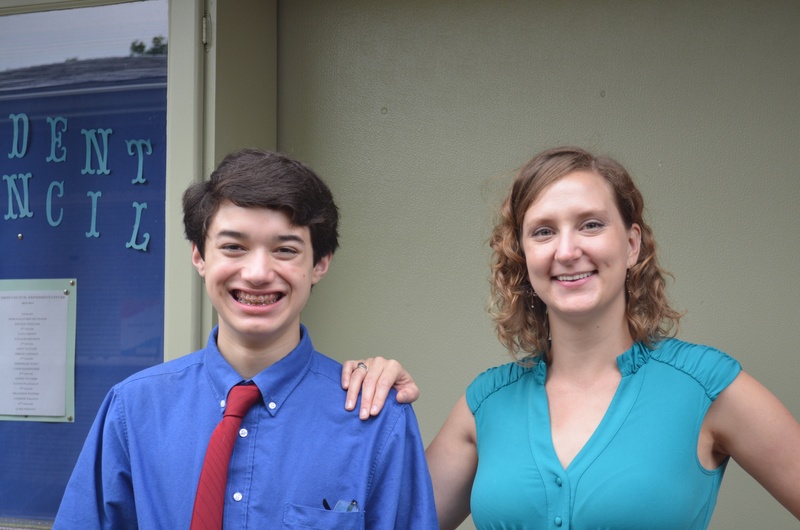 Founded in 1997, Rawson Saunders is the only full-curriculum school in Central Texas exclusively for students with dyslexia. 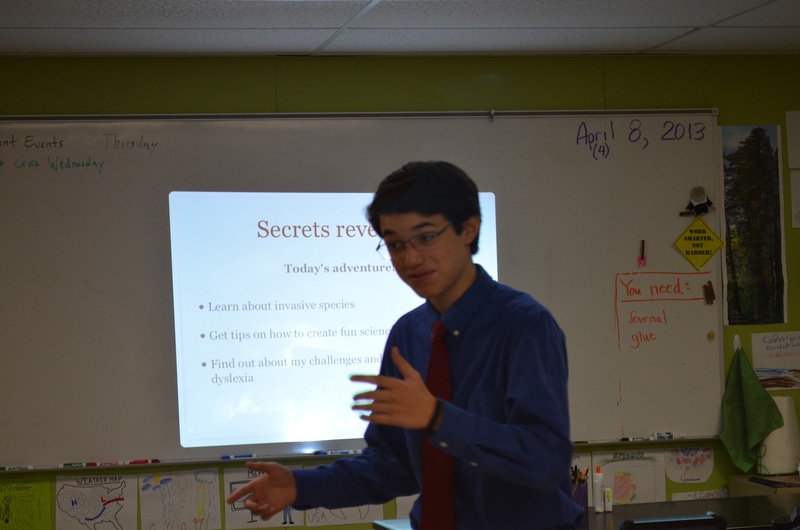 I was invited to speak about my experiences with invasive species and dyslexia, and I had a wonderful time visiting with some great kids who are like me. The day started at around 7:45AM when I arrived at the school and met Dr. Nadia Cone, who is the Academic Technology Coordinator for the school. 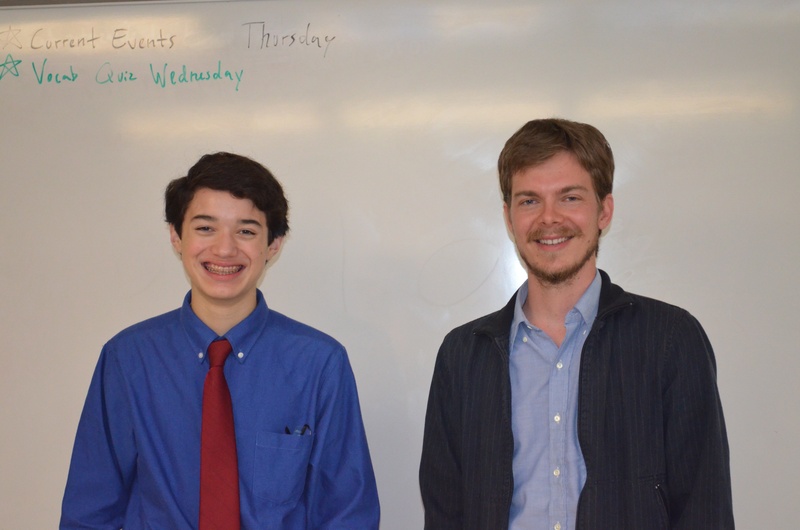 Dr. Cone brought me over to the science lab and introduced me to Mr. Jacob Hendrickson, the science teacher. I set up my iPad and hooked it up to a projector for my Keynote presentation. 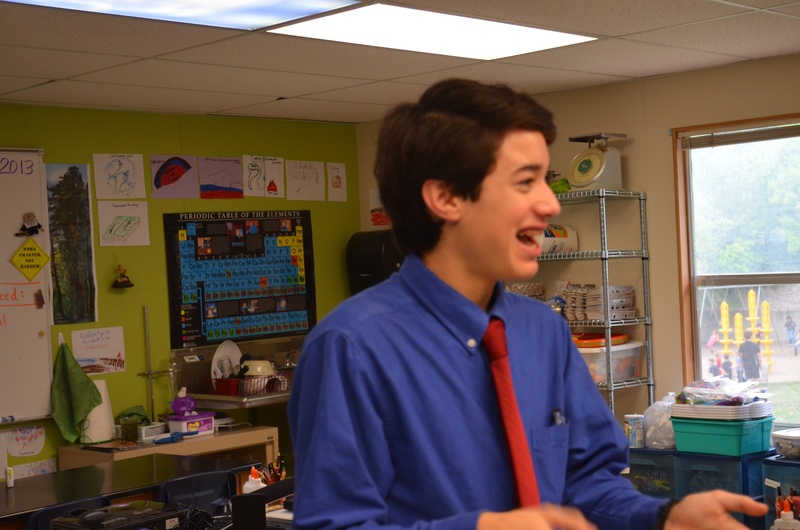 Then around 8AM, the 8th graders started piling into the classroom. I was so nervous! This was the first time I would be giving a presentation to kids my own age. I have given presentations to elementary school kids and high school kids but never middle-schoolers. I was worried that middle school kids might be really hard on me. But I had no need to worry. The kids were great – both the 8th grade class and the 7th grade class. I made lots of new friends! 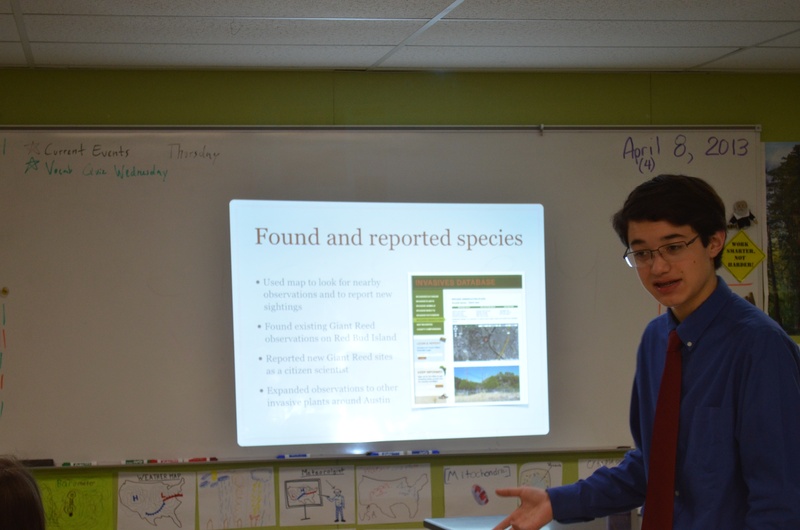 My presentation was all about invasive species, blogging, movie-making…and of course…having dyslexia. It went great. The kids had some interesting questions and also shared some of their own stories with me about things they like to do. It was a lot of fun. Many thanks to Dr. Cone and the great folks at Rawson Saunders for inviting me to speak to your students. I look forward to visiting again in the future. I’m excited about giving more talks to school kids about invasive species and dyslexia, including my upcoming talk to 350 upper elementary students in Milam County this Friday! Plus, I’ll be bringing my Invasive Hunter Academy to the 4th Annual Milam County Nature Festival at the Rockdale Fair Park this Saturday, April 13, 2013. It’s going to be a lot of fun, and I hope to see you there! For too long, invasive species have crowded out native plants and chased away citizen scientists seeking to report them with pen and paper. Now, the Texas Invaders mobile app brings new technologies to help invasive hunters protect their ecosystems in the Lone Star state and beyond. There are a lot of great mobile apps to learn about and report invasive species. Mr. Chuck Bargeron, technology directory for the University of Georgia’s Center for Invasive Species and Ecosystem Health (also known on the web as Bugwood), has created many apps about invasive species. In my How to Succeed in Hunting Invasive Species Without Really Trying blog post, I created a video about a fictional mobile app, but there are lots of great real invasive species apps for your mobile phone. EDDMapS is a national web-based mapping system for documenting invasive species distribution. The photos present in this app are intended to help foresters, urban landscaping employees, or others working with trees recognize some of the common pest insects affecting trees in North America and understand their life cycles and how they damage trees. Submit invasive species observations directly with your mobile device from the field. These reports are uploaded to EDDMapS and emailed directly to local and state verifiers for review. The Outsmart Invasive Species project is a collaboration between the University of Massachusetts Amherst, the Massachusetts Department of Conservation and Recreation (MA DCR), and the Center for Invasive Species and Ecosystem Health at the University of Georgia. One of the greatest dangers to natural areas is the spread of invasive species. This app accesses local lists created by National Park Service rangers and other professionals to show you top invasives species in your area. The Invaders of Texas Citizen Science program collects species observations from volunteer citizen scientists trained to use a specially developed Invasive Species Early Detection and Reporting Kit. The video concerns a young, ambitious native plant defender who, with the help of the smartphone app, “How to succeed in hunting invasive species without really trying”, rises from a budding environmentalist to a fighting naturalist. I have great news to share with you! I’ve been accepted into St. Michael’s Catholic Academy for high school in the fall. I’m very excited, since I’ve been studying hard and took the ISEE exam to get in. Last year, the drama team at St. Michael’s put on a play, “How to succeed in business without really trying“. It was a musical comedy with lots of great student actors, and this got me thinking about making a fun video with invasive species that’s similar to the opening of the play. I hope you enjoy this latest addition to my Battles with Invasive Species video series!